The Squall team’s product prototype pleases big client Acme. But when the client won’t budge on its strict quality, time, or budgetary requirements, the Squall team leaders determine that the best they can offer Acme is the truth. Software development requires a variety of skills, but organizations shouldn’t assume that a worker can move to a new position—be it analyst, manager, or tester—without task-specific education or assistance. Career software assembler Greg Kubaczkowski takes a look at QuickBuild, a Web-based, multi-platform, build management system that facilitates and automates builds with an intuitive user interface and a rich set of features. Programmers must balance time, business needs, and a long-term maintenance profile while producing code. Are you willing to accept the easy path now, even if it means trouble down the road? Tod Golding explains that the fastest way may not always be the right way. According to Brian Marick, software is little more than a service that has been made into an easily mass-produced form. Because of that, software may be attractive only to its creators—but it still should serve its users faithfully. Decades of testing practices are available to today's testers, but sometimes the "old school" approaches are just as powerful as newer tools with evolved frills and features. Chris McMahon offers tips on how you can combine test techniques to improve your agile integration project. Keeping source code functional in the midst of ongoing changes can be tricky, but there are tools available to help you keep bad code under control. In his article, Tom Copeland puts the spotlight on PMD, an open source static analysis tool that can illuminate source code problems and help power up your build process. 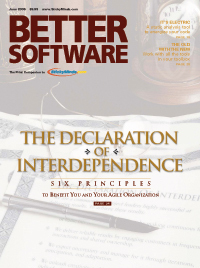 In an effort to extend the Agile Manifesto to non-software products and management, experts at the 2004 Agile Development Conference developed The Declaration of Interdependence. Alistair Cockburn details the DOI’s six principles and how they can benefit your organization. Test Patterns: Nine Techniques to Help Test for a Greater Variety of Bugs. Building on his earlier columns covering James Bach's Heuristic Test Strategy Model, Michael Bolton delivers nine techniques--each of which affords a different way of modeling the product--to help you test your systems for a greater variety of bugs.